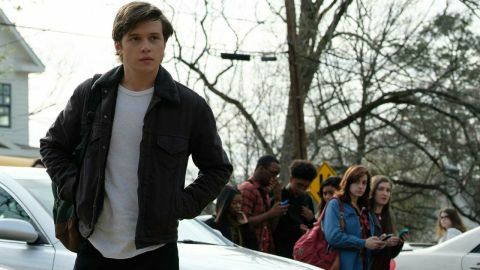 Love, Simon review: "Honest and good-natured without ever being patronising"
A warm, sensitive and engaging coming-out-of-ager, this is one of the freshest teen-coms in ages. Back in the ’90s, you couldn’t move for teen comedies. Few, though, featured gay romances, let alone prominent gay characters, which makes Love, Simon a landmark entry in the genre, even if it’s 20 years late to the party. And though it follows school-com conventions through to the last grand declaration of love, its likeable gay protagonist ensures it feels as fresh and relevant as films such as God’s Own Country and Call Me by Your Name. Based on Becky Albertalli’s novel Simon Vs. The Homo Sapiens Agenda, the film casts appealing every-teen Nick Robinson (Jurassic World) as Simon. Seventeen and just trying to get to graduation in one piece, he is, according to his opening narration, “just like you”. He’s also gay, but nobody knows that. Not his family (Hollywood-perfect parents Jennifer Garner and Josh Duhamel) or his friends (engaging trio Katherine Langford, Alexandra Shipp and Jorge Lendeborg Jr.). Until, that is, another student (Logan Miller) discovers the online romance Simon has struck up with an elusive closeted student known only as ‘Blue’, and uses it as leverage against him. One-time Dawson’s Creek writer Greg Berlanti directs Love, Simon with the kind of pleasingly cynicism-free eye that turned films like 10 Things I Hate About You into teen faves. Rather than relying on sick-bag sentimentality or Mean Girls-esque snark, Love, Simon feels honest and good-natured without ever being patronising. The overriding feeling is of young people attempting to figure out what they want and how to get it, and the mystery – in which Simon attempts to discover Blue’s real identity – cleverly works not only as a traditional whodunit but also a young man’s quest to find somebody just like him. The issue of Simon’s sexuality forms the main throughline, but as sensitive as the film’s ‘coming-out’ observations are, they’re not hugely revelatory. The fact that they’re at the heart of a mainstream movie from a big studio, though, is, especially after 2017’s milestone year for LGBTQ+ cinema. For queer teens who have endured a distinct lack of cinematic representation for too long, Love, Simon is a gift that should guarantee a place in the hallowed halls of high-school movie cultdom. There are the odd missteps. While there’s a great John Waters-esque montage involving straight students having to come out to their parents, a musical segment straight out of (500) Days of Summer is a little try-hard – but then, even Simon thinks so. That’s a minor foible, though, in a film that’s big on heart-swells and relatable emotion. Robinson’s disarmingly unshowy portrayal of Simon builds a quiet charge; he’s a hero who makes mistakes (and pays for them) in a film where the villain is just as likeably flawed.